05: Justice - Arthur and his knights come to a village where the head man has been killed and his alleged murderer Colfur is about to be lynched. Arthur insists he is tried at Camelot as a precedent for a justice system to establish fairness. By getting Guinevere to talk to Colfur's little daughter he finds that the case is not as simple as it first appeared and he is grateful for her help. Sybil suggests Morgan adopt a charm offensive to win hearts and minds away from Arthur but it fails so she employs desperate measures to persuade locals they need Morgan's patronage. Merlin,still shocked by Excalibur's death,shuts himself away designing diagrams,which puzzle Uther's widow Ygrain. 06: Three Journeys - Morgan impresses the supplicants who come to her court but is visited by a woman who claims Sibyl set fire to a convent in which her daughter died,requiring Morgan to punish the nun. Arthur accompanies Guinevere to visit her dying father,resisting further sexual temptations on the journey. Merlin leads Gawain,Kay and Leontes to recover books from Ector's house to start a library in Camelot. The young knights ask Merlin why he has eschewed magic and are told that the gift frightens him but he eventually uses it to help the injured Leontes. 07: The Long Night - Despite the misgivings of Ygrain and Kay, Arthur and his inner circle attend a banquet given by Morgan as a sign of reconciliation,during which her castle is attacked. Arthur's men prepare to defend it but Merlin is suspicious of Sybil as the 'attack' is evidently stage-managed by Morgan to break up the party. Merlin tells Ygrain Morgan killed Pendragon but asks her to keep the news from Arthur. Morgan overhears Arthur tell Guinevere he loves her, which she sees as her key to destroying him. 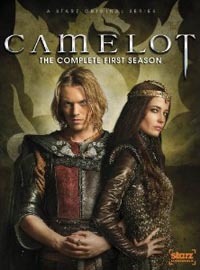 After the 'enemy' has been repulsed Arthur and his party return to Camelot but Morgan has used magic to turn herself into Ygrain,keeping the genuine queen a prisoner in her castle.